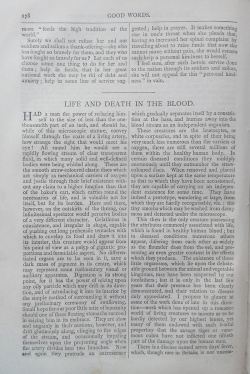 Life and Death in the Blood is an article written by Arthur Conan Doyle published in magazine Good Words in march 1883. 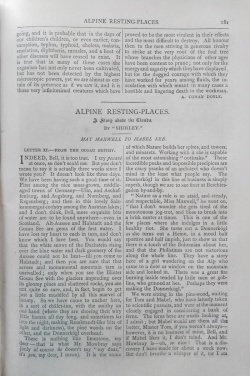 Conan Doyle tells what happens in the blood (leucocytes, virus, vaccines) and scientifics who discovered them. Had a man the power of reducing himself to the size of less than the one-thousandth part of an inch, and should he, while of this microscopic stature, convey himself through the coats of a living artery, how strange the sight that would meet his eye ! All round him he would see a rapidly flowing stream of clear transparent fluid, in which many solid and well-defined bodies were being whirled along. These are the smooth straw-coloured elastic discs which act simply as mechanical carriers of oxygen and jostle through their brief existence without any claim to a higher function than that of the baker's cart, which carries round the necessaries of life, and is valuable not for itself, but for its burden. Here and there, however, on the outskirts of the throng, our infinitesimal spectator would perceive bodies of a very different character. Gelatinous in consistence, and irregular in shape, capable of pushing out long prehensile tentacles with which to envelop its food and draw it into its interior, this creature would appear from his point of view as a polyp of gigantic proportions and formidable aspect. No differentiated organs are to be seen in it, save a dark mass of pigment in its centre, which may represent some rudimentary visual or auditory apparatus. Digestion is its strong point, for it has the power of seizing upon any oily particle which may drift in its direction, and of introducing it into its interior by the simple method of surrounding it without any preliminary ceremony of swallowing. Small hope for our poor little mite of humanity should one of these floating stomachs succeed in seizing him in its embrace. They are slow and ungainly in their motions, however, and drift glutinously along, clinging to the edges of the stream, and occasionally impaling themselves upon the projecting angle when the artery divides into two branches. Nov and again they protrude an excrescence which gradually separates itself by a constriction at the base, and hurries away into the blood stream as an independent organism. These creatures are the leucocytes, or white corpuscles, and in spite of their being very much less numerous than the carriers of oxygen, there are still several millions of them within the healthy human body. In certain diseased conditions they multiply enormously until they outnumber the straw-coloured discs. When removed and placed upon a surface kept at the same temperature as that to which they have been accustomed, they are capable of carrying on an independent existence for some time. They have indeed a prototype, wandering at large, from which they are hardly recognisable, viz. : the tiny amoeba which may be washed from damp moss and detected under the microscope. This then is the only creature possessing the attributes commonly associated with life, which is found in healthy human blood ; but in diseased conditions numerous others appear, differing from each other as widely as the flounder does from the eel, and presenting an even greater contrast in the effects which they produce. The existence of these little organisms, which lie upon the debateable ground between the animal and vegetable kingdoms, may have been suspected by our forefathers; but it is only in the last few years that their presence has been clearly demonstrated, and their relation to disease duly appreciated. I propose to glance at some of the work done of late in this direction — work which has opened up a romance world of living creatures so minute as to be hardly detected by our highest lenses, yet many of them endowed with such fearful properties that the savage tiger or venomous cobra have not inflicted one fiftieth part of the damage upon the human race. There is a disease named seven days' fever, which, though rare in Britain, is not uncommon in the Emerald Isle, as well as in Russia, India, and other places where the fare of the lower orders is exceptionally poor and scanty. Let us go to the bedside of some poor fellow suffering from this complaint, and having once more assumed our microscopic proportions, let us inspect personally the condition of his circulation. We see again the transparent serum, the busy yellow discs, the languid omnivorous pieces of jelly ; but what is this? Writhing their way among the legitimate corpuscles there are countless creatures, thin and long, with snake-like body and spiral motion. They are the spirilla of relapsing fever, discovered by Obermeier in 1872. Where have they come from, and why are they here ? Ah, that is the question to which science is even now striving to give a definite answer. They were not in the blood before, but they are there now in all their grim obtrusive reality, and the fever was coincident with their appearance. In a week they die, and the fever passes away ; but as Dr. Haydenreich, of St. Petersburg, has pointed out, they leave their young behind them, which take seven days to mature. After this short respite, then the patient is once again prostrated by a fresh brood, which in turn gives rise to another; and so the horrible process goes on until either the race dies away, or their victim is exhausted. It was not a human ailment, but one common among cattle, which first drew the attention of the scientific world to the terrible power possessed by these tiny organisms. Splenic fever, since identified as one of the plagues of Egypt, has long been a bugbear of Continental farmers. 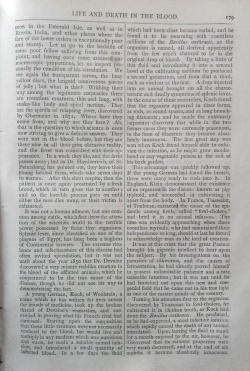 The extreme virulence and infectiousness of this disease had often invited speculation, but it was not until about the year 1850 that Dr. Devaine discovered a very minute rod-like creature in the blood of the afflicted animals, which he conjectured to be the true cause of the disease, though he did not see his way to demonstrating the fact. which had been clear became turbid, and lie found it to be swarming with countless millions of the Bacillus anthracis, as the organism is named, all derived apparently from the few which chanced to be in the original drop of blood. By taking a little of this fluid and introducing it into a second bowl of the cultivating medium he produced a second generation, and from that a third, each as virulent as the first. A drop injected into an animal brought on all the characteristic and deadly symptoms of splenic fever. In the course of these researches, Koch found that the organism appeared in three forms, as rods, as round spores, and as long branching filaments ; and he made the extremely important discovery that while in the two former cases they were extremely poisonous, in the form of filaments they became absolutely innocuous. The first great step was won when Koch found himself able to cultivate the infection, as he might grow monkshood or any vegetable poison in the soil of his back garden. This advantage was quickly followed up. If the young German had found the breach, there were many ready to rush into it. In England, Klein demonstrated the existence of an organism in the disease known as pig-typhoid, and succeeded in cultivating it apart from the body. In France, Toussaint, of Toulouse, extracted the cause of the epidemic among fowls, called "fowl-cholera," and bred it in an animal infusion. The time was evidently approaching when these countless myriads, who had maintained their independence so long, should at last be forced to acknowledge man as the lord of creation. It was at this crisis that the great Pasteur brought his gigantic intellect to bear upon the subject. By his investigations on the parasites of silkworms, and the causes of fermentation, he had already proved himself to possess indomitable patience and a rare scientific intuition ; but it was not until he had launched out upon this new and congenial field that he came out in his true light as one of the master minds of the century. Turning his attention first to the organism. discovered by Toussaint in fowl-cholera, he cultivated it in chicken broth, as Koch had done the Bacillus anthracis. He produced, as he had expected, a most infective infusion which rapidly caused the death of any animal inoculated. Upon leaving the fluid to stand for a month exposed to the air, however, he discovered that its virulent properties were very much decreased, and at the end of six: months it became absolutely innocuous. And now he came upon his great discovery. If a few drops of this innocuous material be introduced into an animal's system, it is protected for ever afterwards against the original disease. This was a gigantic step, as proving that vaccination as a preventive to small-pox was not a mere isolated eccentricity of nature, but part of an endless system, did we but know how to procure the antagonistic materials. Many a man might have rested upon his laurels, but the active brain of Pasteur hurried on to consider the analogous case of the organism cultivated by Koch in splenic fever. Again he made his infusion, again he allowed it to stand until it became weakened, or "attenuated," to use his expression, and again he found to his inexpressible delight that a healthy animal inoculated with this attenuated material was secured for ever against the disease. Here was a great commercial fact. The proofs were overpowering. Government took the matter in hand, and France will soon be a million per annum the richer, that sum representing the yearly loss from the ravages of the disease. We have seen that for the extirpation of this pestilential little rod, three great men had to bring their minds to bear upon it. Devaine saw it, Koch isolated it, Pasteur tamed it. In this work of theirs they conferred a blessing upon men as well as on animals. The bacillus is a creature of cosmopolitan tastes. The butcher who cuts up the diseased carcase and gets one drop of its juices on to a raw surface of his body dies of malignant pustule — one of the most awful maladies that flesh is heir to. The tanner or wool sorter who works with the infected skin, and inhales air laden with the poisonous particles, is struck down by wool-sorter's disease. To these, as well as to cattle, the attenuated virus brings relief. One great thinker stimulates the latent powers of many others. A troop of French worthies have followed in the steps of their chief, and made the last few years redound to the honour of their country. Arloing, Cornevin, and Thomas, of Lyons, have attenuated the organism of another deadly cattle disease, named the "Maladie de Chabert," after its discoverer, and have by inoculation demonstrated the possibility of stamping it out. Galtier and Pasteur himself have been working at hydrophobia, and their researches are most interesting. No doubt, by attenuating the poison, they will be able to inoculate for this malady too, so that from being the most intractable it will become the most docile of diseases ; for remember that inoculation would in all probability be effective even if applied after the bite of the rabid animal. Hitherto we have been considering organisms which affect animals rather than man, and it was natural that these should be the first to be brought under human control, for we have unlimited powers of experimenting upon them. Having established a certain number of facts as a working basis, savants were now able to turn their attention to our own diseases, content to reason by analogy where they were unable to demonstrate by experiment. It was but yesterday, as it were, that scientific investigation was directed into this channel, and yet enormous strides have been made. Toussaint and Koch have demonstrated the existence of a little rod-like creature in tubercle or consumption, which swarms in the diseased lungs, and which, if transferred to another body, will establish itself and breed, thereby proving the malady to be really an infectious one. Whether by inoculating with the weakened infusion they can ward off the disease in a family predisposed to develop it, remains to be seen, but is a perfectly feasible supposition. Another interesting series of experiments has been undertaken by Klebs and Tomassi Crudelli, in the marsh lands of the Campagna. Suspecting the existence of an organism in the swamps which gave rise to ague and remittent fever when introduced into the blood, they examined the soil very carefully, selecting it from the most unhealthy situations. They soon found the creature not only among the damp earth, but also in the air which emanated from the marsh. This organism was also cultivated and showed itself to be amenable to human influences. This is but a hasty glance at what has been done of late years towards subjecting the fishes of the blood. I have not even mentioned the researches of Chauveau, Burdon-Sanderson, and other eminent inquirers. All tend, however, towards the one object. Given that a single disease, proved to depend upon a parasitic organism, can be effectually and certainly stamped out, why should not all diseases depending upon similar causes be also done away with? That is the great question which the scientific world is striving to solve ; and in the face of it how paltry do war and statecraft appear, and everything which fascinates the attention of the multitude! Let things go as they are going, and it is probable that in the days of our children's children, or even earlier, consumption, typhus, typhoid, cholera, malaria, scarlatina, diphtheria, measles, and a host of other diseases will have ceased to exist. 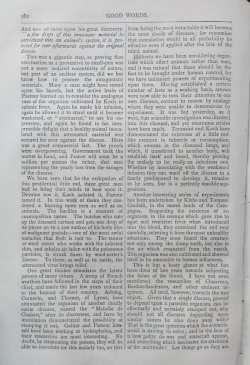 It is true that in many of these cases the organism has not only never been cultivated, but has not been detected by the highest microscopic powers, yet we are almost as certain of its presence as if we saw it, and it is those very infinitesimal creatures which have proved to be the most virulent in their effects and the most difficult to destroy. All honour then to the men striving in generous rivalry to strike at the very root of the foul tree whose branches the physicians of other ages have been content to prune ; not only for the energy and sagacity which they have displayed, but for the dogged courage with which they have worked for years among fluids, the inoculation with which meant in many cases a horrible and lingering death to the workman. This page was last edited on 10 June 2016, at 17:59.